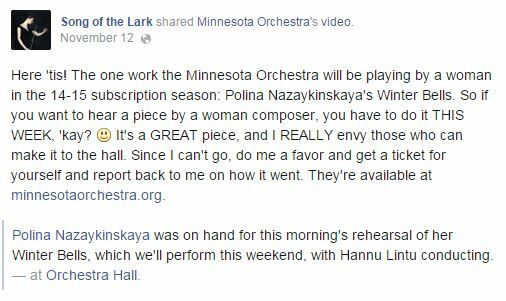 The second of the two concerts presented by the Minnesota Orchestra devoted to (mostly) Russian music included one composition by a living composer. Polina Nazakinskaya was a member of the Composers Institute and “Future Classics” program in 2010. 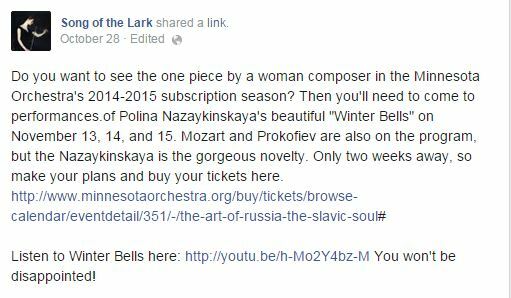 I remember that program and I do not believe that “Winter Bells” was the composition she presented at that time. I could be wrong, but right now I don’t have proof either way. However getting back to the concert that I was able to attend on Thursday morning the 13th, I was very impressed by the rather large number of people in the audience. Being both a composer and a woman myself, and the fact that I have kept in touch with Polina since 2010, I had to be there. 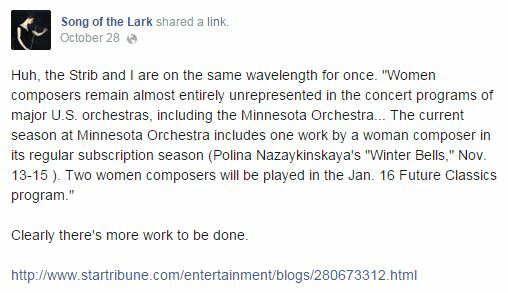 Also I will admit I am a little biased as I love music by Russian composers. Either gender. After this work, the piano came out for the only non-Russian work; Mozart’s Concerto # 20 in d minor. Jonathan Biss is best known for his playing of composers such as Beethoven and Schubert. Which is probably why he performed Mozart’s Concerto # 20 as it is one of the most dramatic of all Mozart’s Concerti. I could not help but feel that his performance was oddly understated. The orchestra and conductor Hannu Lintu worked well with Biss, but there was little fire in his playing. Fire, however, came after intermission. Prokofiev’s 5th Symphony was composed in one month in 1944 and premiered in January 1945. Noted for his near obsession with strong rhythms, Prokofiev begins the work quietly and brings the first movement to an almost explosive ending. The second movement is relentless with rhythms, yet solo woodwinds bring clarity and relief. The war was still raging at the time of this composition and that is obvious in the Adagio third movement where the grief of the war is present yet beautiful. The final Allegro is actually faster than what an Allegro represents, yet it builds to a triumphant and very rhythmic close. Conductor Lintu brought out the very best in the orchestra and they deserved the tremendous applause. I wrote a review for a different “audience.” I like your review better than mine, but I had a few things to say that indicated I was there. And your review, as much as I LOVE it, would not get published in a publication!